This workshop, sponsored by the MREA, will install a 120' guyed tower and a 10 kW Bergey XL wind generator, with the help of a crane. The system will tie into the utility grid with a utility intertie inverter. Ê The workshop will focus on the components of a wind system, site analysis and site improvement, equipment options, system siting and sizing, and installation techniques. Ê This workshop has a limited enrollment. Because this is a hands-on workshop, students should be prepared to get dirty and dress for the weather. Gloves, boots, and work clothes are recommended. 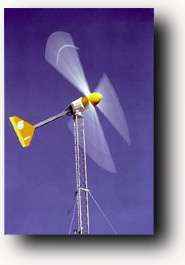 For more information or questions on the wind turbine workshop, contact Clay Sterling at the Midwest Renewable Energy Association (MREA). Registration is to be completed through the MREA at the address below. Registration fees cover printed manual and hands-on instruction. Meals and lodging separate; free camping available on-premise. The Writing and Music B&B rooms are available during the workshop for $90/night and $100/night, respectively, and includes a full breakfast; contact Inn Serendipity for availability. Copyright © 2000-2003 Inn Serendipity. All rights reserved. Please read our legal pages before using this site.